There are many recognizable brands of pocket watches available should you decide to add one to your watch collection. From high-end Tiffany & Co. and Cartier examples made of karat gold to the more affordable models marketed by Elgin and Ball, associating a watch with a brand will help you discern whether you have a $400 watch or a $40,000 one. There are other lesser known brands that are popular with collectors as well. Some of those are railroad pocket watches, which are high quality, precision timepieces that were used to keep train schedules running smoothly. There are also a number of novelty pocket watches that can sell for $1,000 or more at auction today. These may not look like much at first glance, even toy-like in some instances, but it pays to thoroughly research great-grandpa's pocket watch before selling it too cheaply. You can also consider converting a pocket watch to a wristwatch as well. In general terms, a conversion will probably lower the value of a watch. When done right, however, some folks consider it worthwhile because they end up with a watch they can wear and enjoy. 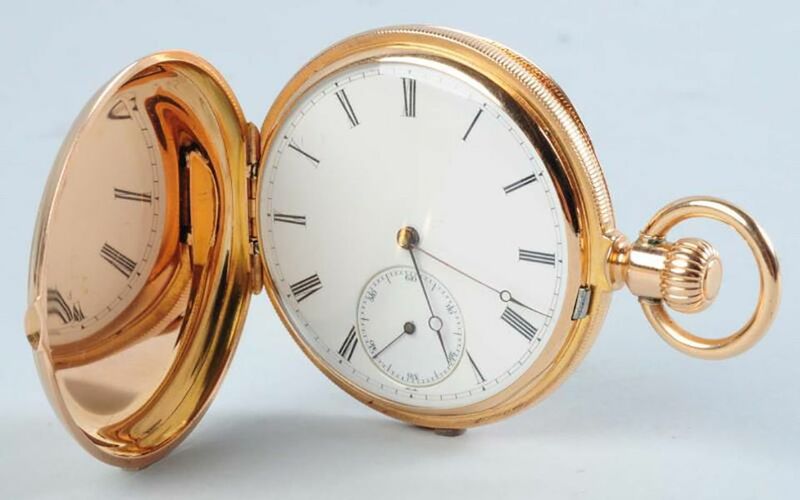 One example is a Patek Philippe 18-karat yellow gold pocket watch with hunter-case (a hinged cover on a pocket watch is a hunter-case as opposed to an open-faced watch that has no cover). In excellent condition, it was auctioned with the original Patek Philippe presentation box. It sold for $3,900 (not including buyer's premium) at Morphy Auctions in 2014. Patek Philippe watches of all types are often passed from generation to generation as family heirlooms and are highly prized by collectors. You may have heard the term "jeweled movement" about various types of watches. This references industrial grade gemstones used as bearings for gears employed to minimize friction and subsequent wear on a watch's mechanism. Having a high number of jewels adds to the value of an antique pocket watch. The higher the quality of the watch, the more jewels it will have—up to 25 in some instances. And, as you might suspect, collectors will pay more to own high jewel watches. The number of adjustments (the calibrations a watch has to keep it running accurately regarding of the position in which it is held) also impact the value of an old pocket timepiece. Look to a watch professional for more guidance, if you're having trouble determining the quality of your antique pocket watch. Watch chains were made in a variety of different styles. They could be made of karat gold for use with top-tier gold watches, gold plated, or silver. They could even be woven of hair, fitted with metal findings, and given as a gift from a bride to a groom during the Victorian era. Regardless of what they were made of, most had a specific type of catch with a curved top and side hook used to hold the watch on one end. The other end could have one of several types of mechanisms used to hold the chain in place on a vest. Some were hooks or loops to fit around a button; others were toggle types that fit through a small hole (finished like a button hole but specifically meant to hold a watch chain). The chain may have a decorative fob. Once fastened to a gentleman's vest, the chain would drape like a garland to the watch pocket where the timepiece was held. The storage of the watch in a vest pocket, in fact, is the origin of the name "pocket" watch. Defining fobs in relation to pocket watches yields two meanings. One is a small ornament suspended from a pocket watch chain. It is sometimes purely decorative, sometimes utilitarian, like a seal or key used to wind a watch. An example is a 10-karat yellow gold Victorian-era charm. However, a link or mesh chain or a length of ribbon used to suspend such an ornament was also called a fob back in the day. These elongated fobs also dangled from a chain, and some held charms on the end. Developed around the 1770s, alongside the invention of pocket watches, fobs were worn by both men and women, attached at the waist or to a belt originally. Their popularity continued throughout the 19th century but gradually became more associated with male attire. Some watch chains held multiple decorative fobs where they dangled similarly to a ladies charm bracelet when draped on a vest. Once pocket watches fell out of fashion, many fobs were refashioned into ladies charm bracelets or worn on necklaces. How Much Are Old Pocket Watches Worth?